Friday's S&P 500 Index advance along with other important indices changed the picture as it appears the operative Rising Wedge could fail, reducing the probability of a meaningful retest of the December 26 bottom. Should it continue higher this important week for earnings reports and more Jay Powell commentary, the bear market label may no longer be applicable. Details follow including updated charts for the S&P 500 Index and Market Breadth as well as our ranker results for the Top 10 ETFs. S&P 500 Index (SPX) 2664.76 declined 5.95 points or -.22% last week, after a gap up opening Friday, then closing 22.43 higher. Now well above the 50-day Moving Average at 2613.88 it appears to be headed for the operative downward sloping trendline from the October 3 high at 2939.80 shown in the chart below. 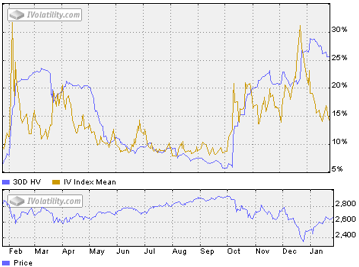 CBOE Volatility Index® (VIX) 17.42 declined .38 points or -2.13% last week . Our similar IVolatility Implied Volatility Index Mean, IVXM using four at-the-money options for each expiration period along with our proprietary technique that includes the delta and vega of each option, gained .38 points or +2.56% ending at 14.41 and still near the bottom of the recent range shown in the updated one-year volatility chart with an SPX line chart below. With 12 trading days until February expiration , the day-weighted premium between February and March allocated 60% to February and 40% to March for a 5.17% premium vs. 2.82% the prior week ending January 18. Below the bottom of the green zone between 10% to 20%, it suggests cautionary positioning unconvinced the SPX advance will continue. Last week it looked like a developing bearish Rising Wedge, but Friday's gap up opening diminished the odds that it will attempt to retest the December 26 low at 2346.58 before attempting to cross back above the downward sloping trendline, DSTL that began on October 3, shown in the chart below. In order to change the trend it needs to close above January 18 high at 2675.47, then continue higher and close above resistance at the DSTL that began October 3, now about 2680. Market Breadth as measured by our preferred gauge, the NYSE ratio adjusted Summation Index that considers the number of issues traded, and reported by McClellan Financial Publications, gained 251.57 points or +325.66 % for the week ending at 328.82 having crossed above the 50-day Moving Average on January 10. When the Summation Index turns start looking for other confirming indicators especially trendlines. 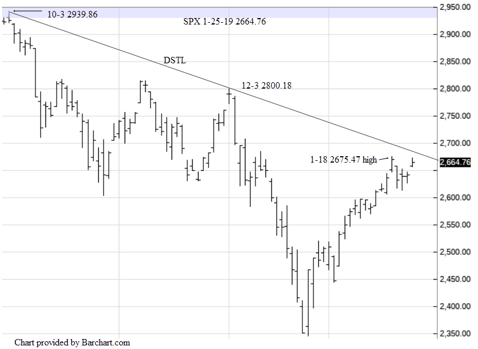 For now it looks like it will continue higher suggesting the S&P 500 Index will soon close back above the operative downward sloping trendline. Here are the results from our proprietary Stock Sentiment Ranker set to find the top bullish ETFs. Top ranked SPDR Gold Shares (GLD) and eight ranked VanEck Vectors Gold Miners (GDX) have both been trending higher since mid November and gapped up at the opening Friday as the US Dollar Index (DX) declined. Number 2 ranked iShares China Large Cap (FXI) made a double bottom between late November and late December. Number 3 ranked iShares MSCI EAFE (EFA) the ETF for Europe, Australasia and the Far East excluding the US and Canada, crossed back above its downward sloping trendline two weeks ago along with the others except for SPDR S&P 500 (SPY) lagging. After Friday's advance that delayed or ended the Rising Wedge pattern, along with improving market breadth the bear image in this space for the last few issues has been replaced with a small bull. Advances by FXI and EFA suggest improving China and Asia sentiment after comments about new stimulus plans begin considered in China. Gold and the other ETFs were also helped by a declining US Dollar Index. With more comments from Jay Powell scheduled for Wednesday it suggests the markets are expecting a more dovish stance by the Federal Reserve. Should Federal Reserve Chairman Jay Powell disappoint once again, last week's gains could quickly evaporate. Along that line, the 10-day VIX correlation indicator was suggesting trouble Thursday as it increased to -.16 before declining to -.29 Friday. For example on January 18 the correlation was -.85. In the past this correlation decreased (less negative ) just before short-term pull backs. 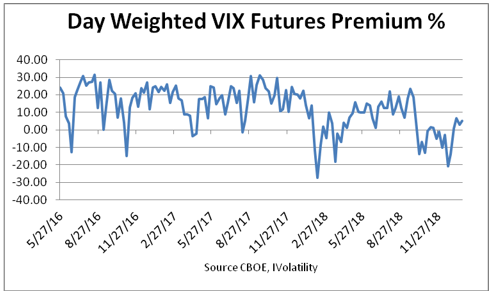 This means option traders and strategist are more cautious than usual since the VIX was increasing as the SPX advanced while the normal state is for them to move in the opposite direction, that is negatively correlated about -.90. Although the indicators and ETFs are suggesting a little less bearish and a little more bullish, this should be a defining week with many important earnings reports along with more Jay Powell commentary. At the start of last week it looked as if the S&P 500 Index was about to retest the December 26 low as suggested by a potential developing Rising Wedge. However, Friday the picture changed as the US Dollar declined along with news that China was considering new stimulus measures. While the futures and options indicators remained slightly negative, market breadth continued improving enough to challenge the previous bear market call.